In the beginning of Shemot, the Israelites were forced to build arei miskenot ערי מסכנות - "storage cities" (Shemot 1:11). The root סכן is found in a number of Hebrew words going back to Biblical times - some still in use today, some less so. Let's first look at the different meanings, and then try to see if they are connected. 1) The verb סכן (in the kal form) can mean "was useful, benefited". This sense is found in Iyov 15:3, 22:2, 34:9, 35:3. 2) In the hifil form (הסכין), it means "was accustomed, was used to". This form appears in Bamidbar 22:30, Tehilim 139:3, and Iyov 22:21. 3) The familiar word sakana סכנה - "danger" does not appear in the Tanach (it appears frequently in Rabbinic Hebrew). But it does appear as a nifal verb once in Kohelet 10:9 יסכן - "will be harmed". In Rabbinic Hebrew we find the piel form, meaning "to expose to danger". Derivatives include sikun סיכון - "risk" and misukan מסוכן - which in the Talmud meant "in danger" but by Medieval Hebrew meant "dangerous". 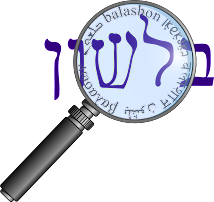 4) The noun sochen סוכן is found in Yeshayahu 22:15, and as sochenet סוכנת in Melachim I 1:2,4. It is usually translated there as "steward" or "attendant". In Modern Hebrew, sochen means "agent" and sochnut סוכנות is "agency". French, from Italian meschino, from Arabic miskin, (in VArab. pronunciation meskin), 'poor, wretched, miserable', which is borrowed from Hebrew or Aramaic misken or Syriac mesken, 'poor', which are perhaps loan words from Akkadian mushkenu, 'beggar, needy'. 6) As I mentioned above, miskenot means storehouses. In addition to Shemot, the word also appears in Melachim I 9:19, and Divrei HaYamim II 8:4,6; 16:4;17:12 and 32:28. So what are the connections between the words? Let's start with Klein. Without explaining why, he puts verbs 1 and 2 in the same entry. I assume that if one is good at something, he is both "useful" and "becomes accustomed". He says it is related to the Akkadian phrase sakanu ana as found in the Tel Amarna letters, which means "to care for". Based on this, he connects this root to sochen, who cares for people. Shaph'el forms of כון (=to be, be set up, be established), hence literally mean 'to cause to be, cause to be set up, cause to be established'. Probably a loan word from Akkadian mashkanu (=storehouse, magazine), from shakanu (= to lay, place deposit, store up), which is related to the Hebrew שכן (= he dwelled, abode). However, he doesn't connected misken or sakana to any of the others. The Daat Mikra on Devarim 8:9 connects (5) and (6) by pointing out that storehouses are needed when food is not plentiful, and needs to be rationed, like with a poor person. Steinberg connects all the meanings under the general header of "concerned about the needs of his master". This concern causes one to try to do his best job to help (1), and to be very careful about doing things (2), and to be aware of danger (3). Naturally, this is the role of the sochen, a poor person is concerned about food, and the storehouses stored food for a country concerned about famine in the future. He rejects the unnecessary complications of Gesenius and Furst, when it is clear to him that the words are related. His explanation is certainly clean and inviting. But I think in a way, it's a bit too clean, and language doesn't usually develop just like that. So I'm inclined to accept the opinions of the later scholars who show various sources for the different meanings of the root.